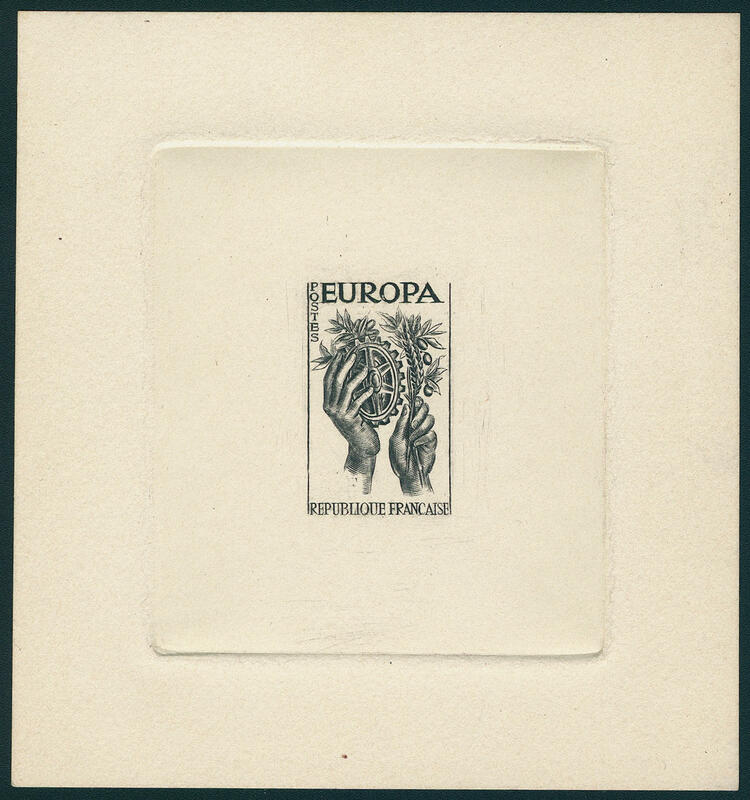 3797 Fheetlet 1157Probe Europe 1957, Artist block in black, without numeral of value on hand made paper in perfect condition. Very rare! 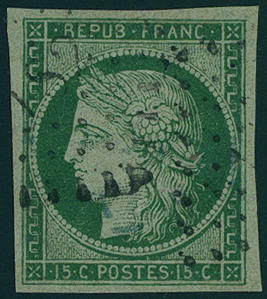 3800 6a 40 C. Blue, having bright colors, on all sides perfect margined unused outstanding quality. Michel 350,- €. 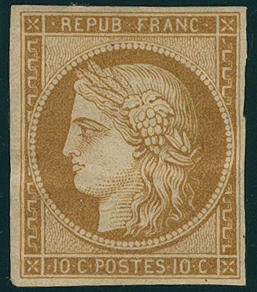 3801 7 60 C. Yellow brown, wonderful having bright colors, on all sides with enormous margins unused outstanding quality. Michel 600,- €. 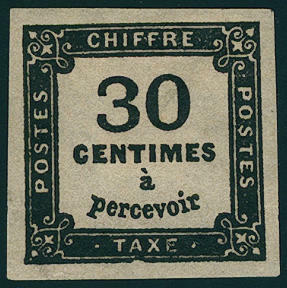 3802 8 30 C. Black, having bright colors, on all sides with enormous margins unused outstanding quality. Michel 280,- €. 3803 20 60 C. Black, fresh colors and in perfect condition unused with original gumming. Michel 600,- €. 3804 20 60 C. Black, fresh colors and in perfect condition unused with original gumming. Michel 600,- €. 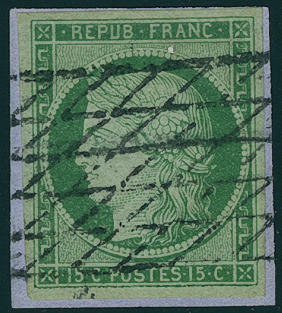 3805 ⊙ 24/26 Postage due set 1884, fresh colors and neat cancelled Michel 600,- €. 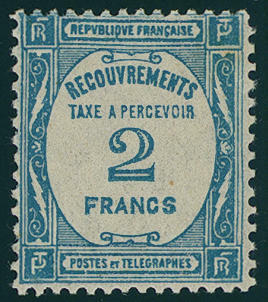 3806 25 2 Fr. 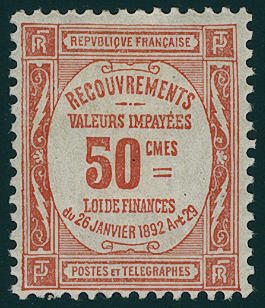 Red-brown, fresh colors and nearly mint never hinged, signed. Michel 200,- €. 3807 39 50 C. Brick red, fresh colors and in perfect condition unused. Michel 350,- €. 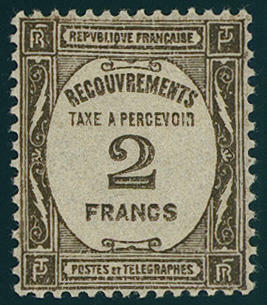 3808 57/61 Postal order stamps 1927, in perfect condition mint never hinged Michel 170,- €. 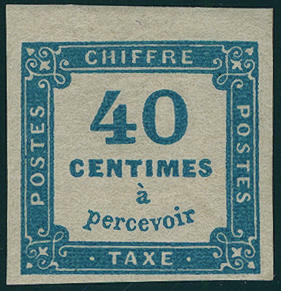 3809 62/63 Postal order stamps 1929, in perfect condition mint never hinged Michel 190,- €. 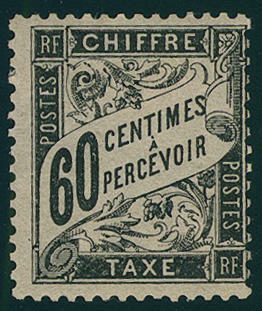 3810 66 2 Fr. 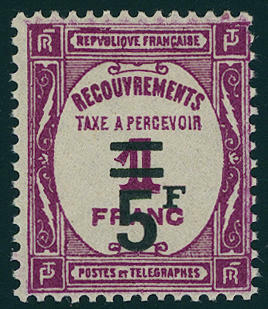 Sepia 1931, fresh colors and in perfect condition mint never hinged, without any signs. Maury 340,- €. 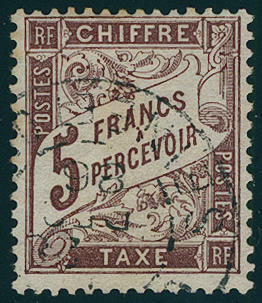 3811 66 2 Fr. 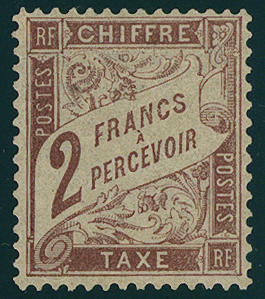 Sepia 1931, fresh colors and in perfect condition mint never hinged Michel 270,- €. 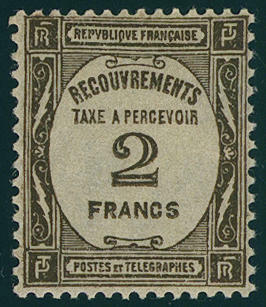 3812 ⊙ 4 2 Fr. 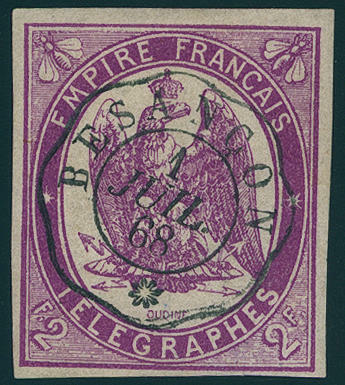 Violet, fresh colors and large margins all around, very fine centric cancellation \"BESANCON 1. JUIL. 68. \". An exception copy! 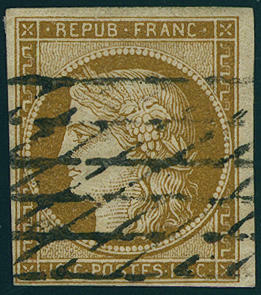 3680 1a 10 C. Yellow brown, wonderful fresh colors and large margins all around with larger hinge trace and original gumming, superb. Michel 1800,- €. 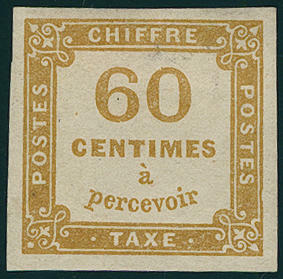 3681 ⊙ 1a 10 C. Yellow brown, horizontal pair, wonderful fresh colors and large margins all around and neat cancelled \"PETITS CHIFFRES\". A very nice pair, superb in every respect (choice copy)! Photo expertize Dr. Goebel BPP. 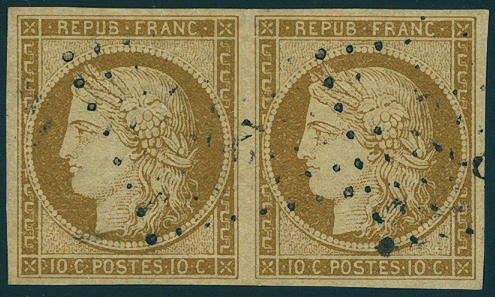 3682 ⊙ 1a 10 C. Yellow brown, having bright colors, on all sides full- to piece in outstanding quality with enormous margins with good cancellation through \"grill SANS FIN\". Ceres 500,- €. 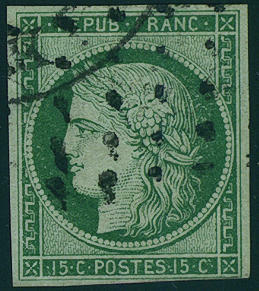 3683 ⊙ 2a 15 C. Green, having bright colors, on all sides full to wide margins used extremely fine copy, expertized angel BPP. Michel 1200,- €. 3684 ⊙ 2a 15 C. Green, having bright colors and on all sides with enormous margins used extremely fine copy. Michel 1200,- €. 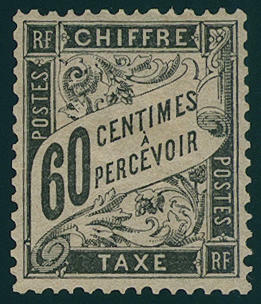 3685 ∆ 2a 15 C. Green, wonderful having bright colors, on all sides piece in outstanding quality with enormous margins on magnificent letter piece with good cancellation through \"grill SANS FIN\". An exception copy for the highest standards!